Investigators killed a 12-foot alligator that was captured near the scene of the woman's disappearance. 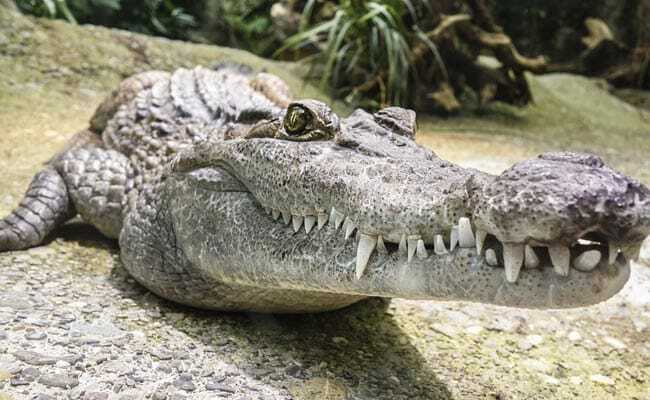 A Florida woman is believed to be dead after an alligator attack in Davie, according to the Florida Fish and Wildlife Conservation Commission. Investigators killed a 12-foot alligator that was captured near the scene of the woman's disappearance and found evidence that the reptile had bitten the woman. Local broadcaster WPLG reported that a human arm was found inside the animal. FWC spokesman Rob Klepper identified the woman as 47-year-old Shizuka Matsuki, of Plantation, Florida. A witness saw Matsuki walking two dogs and contacted police when they saw the dogs alone and unattended, according to FWC. "[Matsuki's] dogs won't leave the pond," Davie Police Maj. Dale Engle told the Sun-Sentinel. "One of her dogs got bit by the gator." The Sun-Sentinel identified Matsuki after speaking to relatives who had appeared at the park after her disappearance. A 2-year-old boy was killed by an alligator at Disney's Grand Floridian Resort & Spa in 2016. The boy's death garnered headlines around the world and spurred questions about warning signs at the property in Bay Lake, Florida. Florida Man Shoots Gator. Then The Gator Bites His Son.